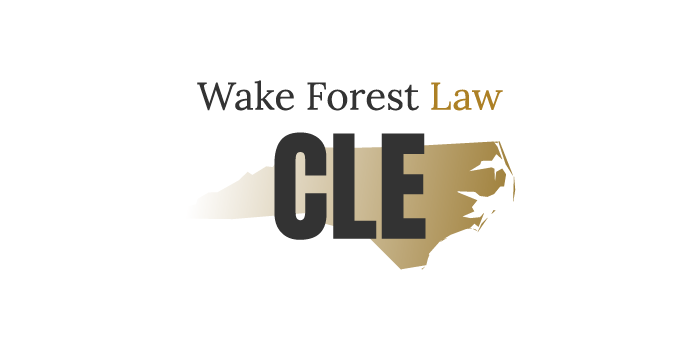 (Winston-Salem, N.C., Jan. 17, 2018) — Wake Forest School of Law will host multiple Continuing Legal Education (CLE) opportunities throughout the state of North Carolina during the spring of 2019. Attendance permits attorneys to fulfill mandatory CLE requirements, including technology, ethics, and general CLE credit hours. Interested attorneys are encouraged to register for these events, which are described below. Dean Suzanne Reynolds (JD ’77) and David Furr (BA ’80, JD ’82) will present a 1.5-hour CLE Ethics course entitled, “Cyber Security and Ethical Issues for Lawyers,” which will provide attendees with a comprehensive review of practice issues relating to cyber threats. The attorney-client interaction under the Revised Formal Opinion 477 as well as Rule 1.1: Competence and Rule 1.6: Confidentiality of Information will also be discussed. This course is pending approval for 1 hour of Technology CLE credit and one half hour of Ethics CLE credit. The following CLE events will begin at 2:30 p.m. and run until 4 p.m. at each designated location. A reception will immediately follow each event. Contact Megan Ratley with registration questions or interest at ratleyml@wfu.edu. • Greensboro, N.C. | Monday, Feb. 11, 2019 • Brooks Pierce • 2:30 p.m. – 4 p.m. This course is pending approval for 1 hour of Technology CLE credit and one half hour of Ethics CLE credit. Register for this event at wfu.law/nt9. Questions or interest may be directed to Megan Ratley at ratleyml@wfu.edu. Dean Suzanne Reynolds (JD ’77) and John Robinson will present the program, “The Ethics of Clarence Darrow.” Robinson will perform as Clarence Darrow, one of the most well-known civil libertarians and lawyers in U.S. history. A reception will immediately follow. This course is pending approval for 2 hours of general CLE credit and 2 hours of Ethics CLE credit. Register for this event at wfu.law/v8y. Questions or interest may be directed to Megan Ratley at ratleyml@wfu.edu. Charlotte, N.C. | Friday, April 12, 2019 • Wake Forest Charlotte Center • 8 a.m. – 4:30 p.m. This event will provide comprehensive training about issues in practice and in business. Each speaker will breakdown industry-specific jargon, so attendees can better understand crypto-technology, help their clients and companies mitigate risk, and explore blockchain-related business opportunities. The morning session will focus on explaining the technology’s tools and offers two CLE technology credits. The afternoon session will emphasize ethics and how the blockchain space is impacting tax and securities regulation and will offer a CLE ethics credit. Interested attendees can choose to participate in either a full-day or half-day session. By attending the full-day session, attendees may receive six CLE credits, which is half of the year’s requirement, as well as fulfill CLE ethics and technology requirements. Register to attend this executive education program at wfu.law/2019WFUexEd. Wake Forest School of Law has committed to keeping legal education small and personable for over 35 years. Established in 1894, the law school is located in Winston-Salem, N.C. Wake Forest law school is ranked No. 32 in the nation and offers several degrees, which include the Juris Doctor (JD) with dual and concurrent degree options, an online Master of Studies in Law (MSL), a Master of Laws (LL.M. ), and the Doctor of Juridical Science (SJD). Learn more about Wake Forest School of Law at www.law.wfu.edu. Correction: The original announcement stated that Dean Suzanne Reynolds and Professor Steve Nickles would present “Radical Change in Lawyering: The Main Drivers” in Greensboro, N.C. The event itself has been changed to a joint 1.5 hour CLE that will include two presentations: “The UBE, the GRE, and Me: What Do These Mean for the (New) Practice of Law” and “Technology for Today: The Ethical and Practical Rules of Engagement.” Details are listed listed above.